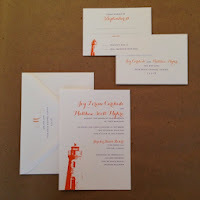 these invitations for joy + matthew's wedding were fun to design! using their clemson university colors with simple and elegant fonts resulted in an invitation that says fall celebration! they used a lighthouse graphic on their save the dates so it was a nice idea to add them to the wedding invite too. a big thanks to joy for letting me help gather friends and family for her harvest-inspired florida wedding! !